Velomobiles are intriguing to everyone. More than a bicycle, less than a car, they create a whole new category. By the way, the word comes from Velo- which is part of velodrome, velocipede, velocity, etc., and -mobile which we all know means non-stationary as in automobile. So, we have a fast-moving machine that is not a motorcycle or a bicycle, nor an automobile . . . a velomobile. They take on many shapes. Some look like a torpedo, a missile, a rocket and even a kayak. Some take on the appearance of a spaceship from days when science fiction was . . . well, fiction. Kids want to climb into them, moms think they are cute and dads want to afford them. 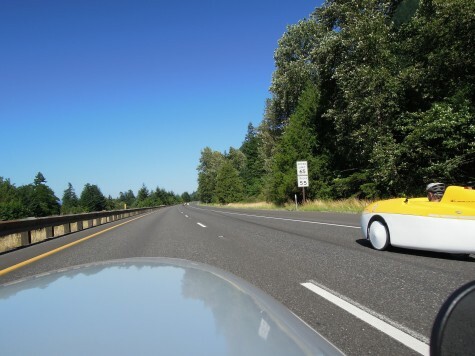 Technical nerds are interested in the aerodynamics of velomobiles and get excited about how fast they can go. 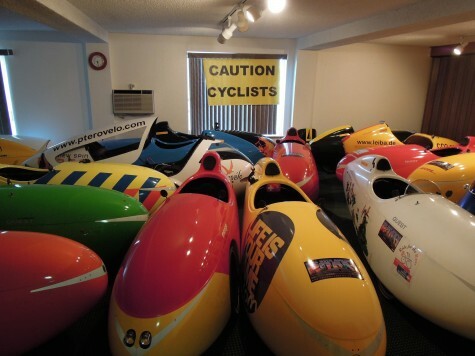 They site that all human-powered speed records are held by streamlined bicycles and tricycles with riders pedaling in the recumbent position. The green crowd likes the car free future that velomobiles are sure to be a part of. 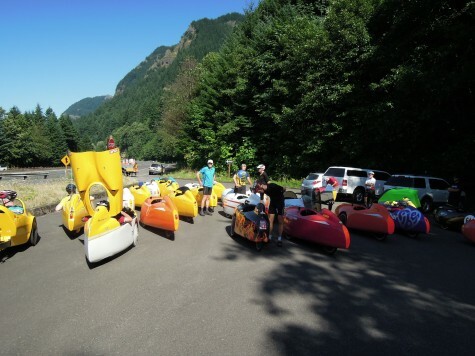 Velomobiles are low pollution, low noise and take up less space on the planet. Fitness nuts point out the intrinsic good of burning your own calories while going from place to place, paying fewer doctor bills and buying less medication. And then, there are the show-boaters that like to be seen. They talk about the extra visibility being safer, and the advertising value, but realistically they are unlikely to be introverts. One of the better recumbent trike lines we represent here at RideSouth is Greenspeed. 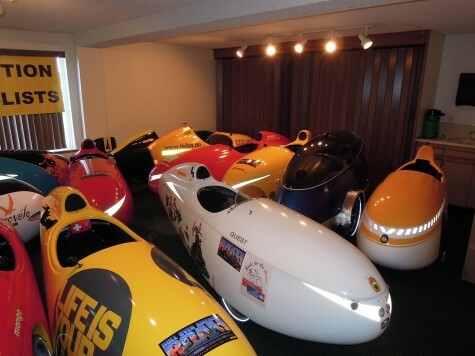 The Glyde was Greenspeed’s entry into the velomobile arena. We purchased one of the last machines made by the Australian company in the early part of 2010, probably for all of the above reasons. We put our logo on it and pedaled it all over Mississippi. We found that the 85 pound machine was a load going up hills, as you might expect, but the extreme speed and exhilaration felt going down the hills made up for it! Yes, we could ride in the Mississippi heat, but you had to keep moving to keep the ventilation working. Being shielded from the sun on most of your body played a big part in preventing overheating. Of course, riding in the winter was a blast unless your windshield iced over. An unexpected benefit was riding in car traffic and people traffic. Once we took the Glyde to New Orleans and rode the levy on the way to a Mardi Gras parade downtown. Most folks rode recumbent bikes or trikes. The weather was cold and blustery, but I was cozy with shorts on inside the Glyde. It was easy navigating the streets of the French Quarter and the parade watchers there were watching me, not the parade! I could push through the crowds with ease and I think the other recumbent riders were a little jealous that the Glyde stole the show! 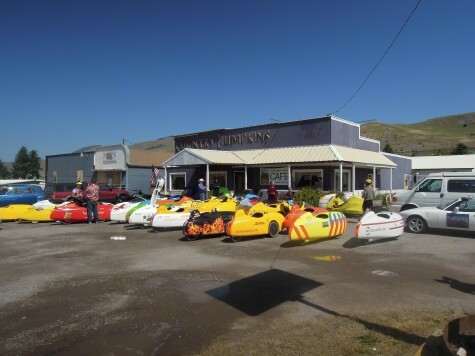 We have also used velomobiles in a number of parades. They are fun to decorate and a definite hit with kids of all ages! 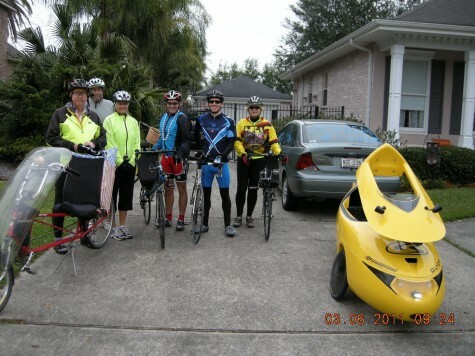 One day I saw a post talking about a group of Europeans wanting to cross America on velomobiles. As I was very much a novice velonaut, I thought this might be a good way to learn from more experienced pilots. 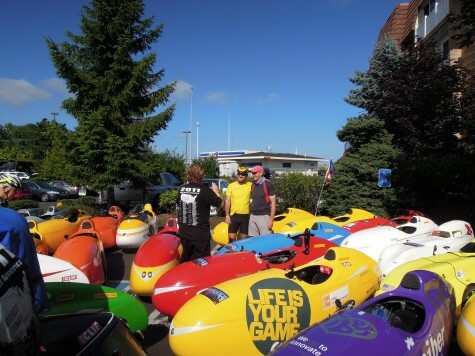 We had already hooked up with Sinner in the Netherlands, a velomobile manufacturer, and sold a couple of machines, including a WAW from Belgium. This would be a good chance to see all types of machines at once! 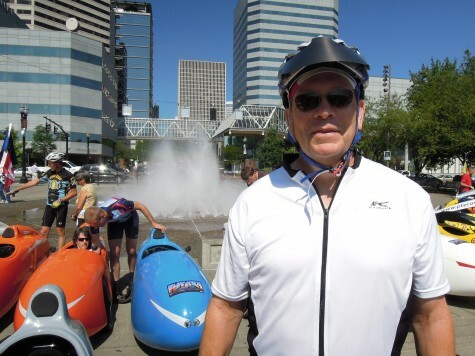 The Roll Over America (ROAM) plan was to ride from Portland, Oregon to Washington, DC in 30 days. That is 3050 miles, or almost 120 miles a day, counting rest days. The 45 riders would have to average about 20 mph and must be in DC by August 28 to catch the ship home. There were older guys than me going and the trip was almost a year away, so I signed up. Initially, I planned on taking the Glyde, but shipping issues, and weight, helped to change my mind. The Mango Sport, from Sinner Bikes, was the lightest and most maneuverable machine around. I though that might come in handy crossing America’s mountain ranges. I organized shipping, lodging and camping gear. Leaving the shop for a month was one of the toughest parts. Lane was encouraging and said she, Johnny and Drez, along with Louis’s help, could keep it going. Training began and I felt ready when the time came. Doug was going to Paris to ride in a major event and could bring me and the Mango back from DC in his pick-up. The planets were aligning. We packed up the Mango, calculated shipping time, and secured a flight to Portland. Everyone gave me a great send off and it was game on. 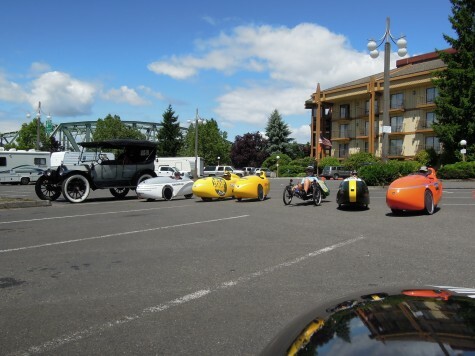 I arrived at the Day’s Inn in Portland, Oregon about 2:00 PM in the afternoon, two days before the launch of ROAM. Roll Over America had been conceived by the European riders and their leader in this endeavor, Josef Janning. I met him and many of the riders in the hotel lobby. They asked me when my Mango would arrive. As if on cue, the UPS Freight truck drove up outside the hotel with my ride about 3:00 PM! Everything was in perfect condition. Way to go UPS Freight! I arranged to take the palet and box to the receiving warehouse for the other riders’ velomobiles in case I, or someone else, needed it along the way. All of their shipping boxes were being transported to DC to use on their return trip home. A contrast in transportation choices! There were organized briefings, rides around Portland and lots of media opportunities happening the next day. Portland is a bicycle friendly city by any standard and the other riders were impressed. Way to go Portland! We toured the Terra-cycle machine shop and enjoyed meeting the good folks that make all the cool idlers, bags and other accessories for recumbents. The hotel was perfect and accommodating for the machines and the riders. 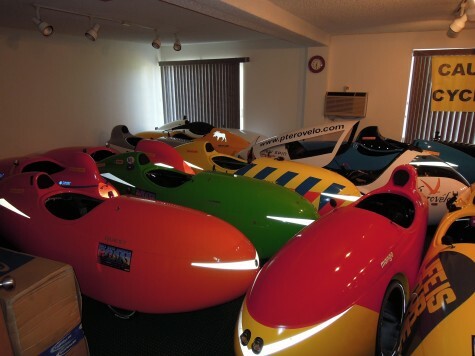 It was impressive to see the conference room stuffed with multi-colored velomobiles at the end of the day! Frans talking to a reporter at the hotel. Josef presenting poster to Day’s Inn manager. The send-off involved us riding downtown to the city fountain and being acknowledged by the mayor. I was glad I had the Mango when I saw many riders in longer, less maneuverable machines, have to get out and move the tail of their machine to get around some city paths. Many riders had fun riding through the fountain and there were quite a few other cyclists out to see us off. By the time television and radio crews finished their work we were more than ready to get on the road. The sun was bearing down, it was hot and adrenalin was pumping. TV reporter climbs out of Nina’s bike. Thinking that it would be easy to follow each other, and hoping each rider would direct the rider behind, quickly became a failed plan. Fast machines would quickly disappear in the twists and turns and more than once did I see riders back-tracking on the bike trails leading out of the city. Eventually, everyone gathered together as the highway patrol led us through a tunnel. We had a certain window of opportunity when traffic was to be blocked, and some of us barely made it! There was little time to soak in the beautiful scenery of the Oregon countryside. Many cyclists joined us on the trails. They would pass some of us on the hills, but none on the descents. This could be fun! Previous post: What’s it worth?